Huawei / Honor GPU Turbo update: what is it, what does it do, when can you get it? Huawei and Honor have been making a big deal about the latest feature that's been pushed to their smartphones. 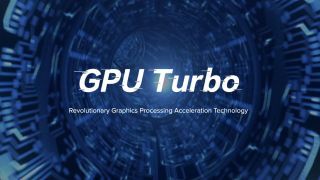 It's called GPU Turbo and it will, the firms claim, dramatically improve your mobile gaming experience. In short, the GPU Turbo update increases processor performance when demanding games are launched, improving the graphics and reducing latency for slicker gameplay. However details on how it works, what it does, how to download it and what phones it's available on aren't so clear. We've been in touch with Huawei and Honor to find out more information about the GPU Turbo update, and you can find all the information you need below. What is the GPU Turbo update? It's a software update that will be pushed over-the-air to your Huawei or Honor smartphone, with the purpose of enhancing performance and optimizing your gaming experience. The GPU Turbo update provides a dramatic increase in graphics processing power, and boosts average frame rate to the fullest possible rate. How do I turn GPU Turbo on? You don't, it's 'always on’, but will only come into play when a graphically demanding game is launched. There's no visible icon or on-screen clue to tell you that GPU Turbo is working, you just have to trust that it's working. What games does GPU Turbo work with? There's no set list of games that GPU Turbo enhances, with a Honor spokesperson telling us "GPU Turbo will benefit users who play mobile games that demand high graphics processing efficiency." However, we know it does work with PUBG (PlayerUnknown’s Battlegrounds) and we're told "you may also notice the improvement of frame rate and FPS on other games like Asphalt 9, Arena of Valor, Mobile Legend, etc." Tests conducted by XDA Developers and GSM Arena show that the GPU Turbo update running on the Honor 10 while playing PUBG and Mobile Legends did result in a higher, more consistent frame rate and some better battery efficiency - which is good news. How do I get the GPU Turbo update? First you'll need a compatible handset (see the section below), and then you'll need to check for the latest software. The software update tool can be found in Settings and the GPU Turbo feature will be listed in the change log for the update. Some handsets have already received the update, while others will be getting the GPU Turbo update in the coming weeks and months. Which phones are getting the GPU Turbo update? There are a number of Huawei and Honor smartphones in line for the GPU Turbo update, including some older handsets, which is impressive. Usually these kinds of updates are reserved only for the most recent releases, so it's good to see the firms widening the availability of the update.